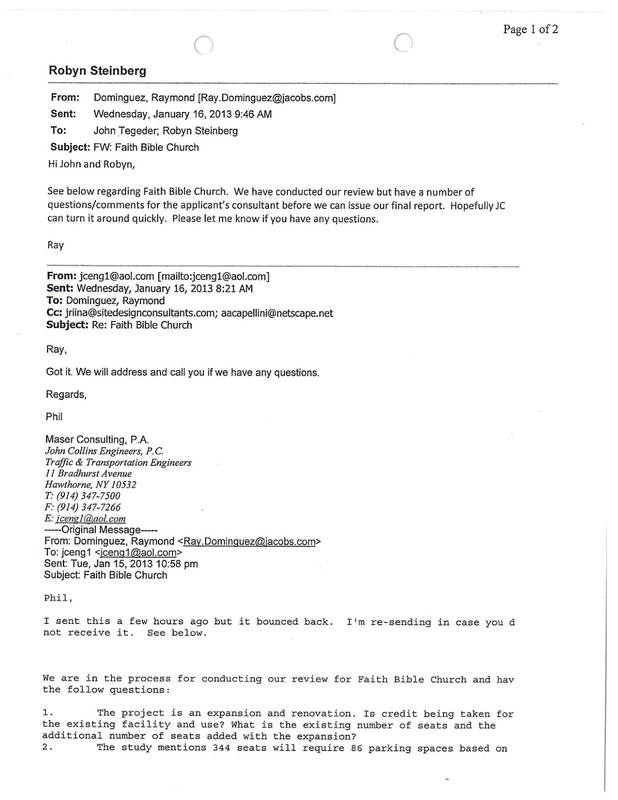 It would seem that John Collins Engineers (FBC's paid traffic consultant; why do I mention that? FBC had the option to hire Jacobs directly and instead chose to engage John Collins Engineers P.C., at an additional cost; curious move from a financial standpoint) used a ratio of nearly 1/2 the proscribed code standard [.31 instead of .61]. Rookie move? Unlikely since they've been around a long time and have a great reputation. I'm interested to see the explanation. Stay tuned. To read all of the comments from Jacobs, click on the "read more" link below. Labels: Parking, Parking Woes, Rookie Move? Wow! What a weekend. I think I skated for 20 miles. No lie. And it looks like we will get one really warm day to hopefully Zamboni the entire lake and a deep freeze sets in on Friday. It's really hard to predict, but I'm hopeful we'll have another weekend of pure, unadulterated, awesomeness. Keep thinking cold thoughts, Mohegan Lake. Me and my cousin made this sweet ice rink in front of our house to practice on. Just look at my 6 and 4 year olds getting the hang of it. Not too bad. I'm going to go ahead and call the +50K on our home value. Hope to see you next weekend. Which brings me to my next point: who's hitting golf balls on to the lake in below freezing weather? Oh, wait, there actually already is a law. I've written extensively about the egregious violations of the Yorktown Code that occur immediately adjacent to my family's home. 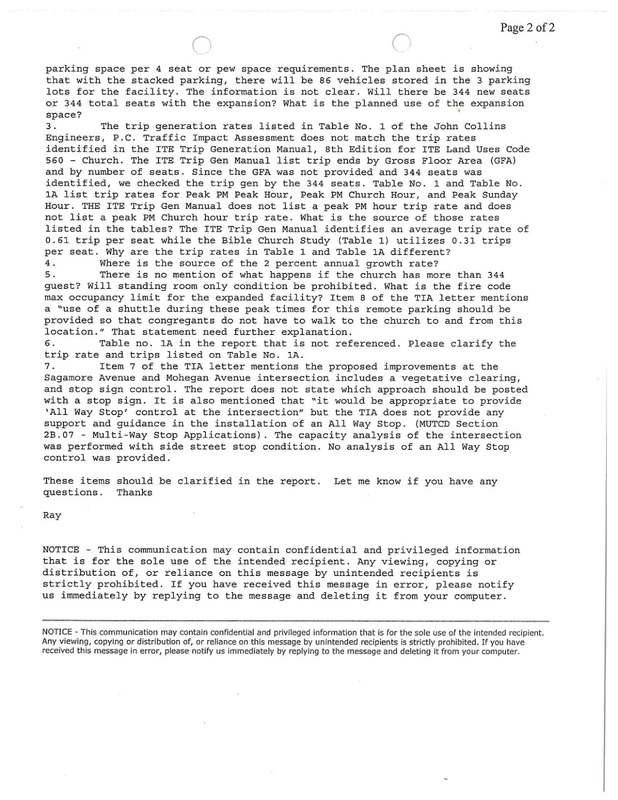 I wrote dozens of correspondence to the Yorktown Building Department and Code Enforcement office over a 2 year period. I supplied all of the town records of the Assessor and Building Department showing that the two houses next to my house are--in fact--still legally houses and were illegally converted to enlarge a very small church to a much bigger one. I never once received a courtesy of a reply and the owner that violated the law and continues to do so gets off Scott free. In fact, they are using the illegal conversion which drastically altered the character of this small residential community to make an argument that the they should be allowed to triple it without increasing parking. 1) I was reading The Yorktown News (that paper you get in the mail and doesn't publish online) about the new garbage hauler, Competition Carting. It was a mostly complimentary article (I've been satisfied with them so far), but near the end, it stated that the Competition was parking their trucks on a parcel that does not have the requisite special use permit to park trucks. It went on to state that the Yorktown Code enforcement office Jason Zeif sent a notice of violation to the property owner. I point out nearly an identical case of an owner needing a special use permit and operating without it for years and the Town is silent. These trucks are parked like this for 2 weeks and the town issues a violation. It appears that the only place the town enforces its laws are in Yorktown Heights! 2) I was speaking with the president of one of the 7 Home owners association yesterday (I'm vice president of the Mohegan Highlands Property Owners Association). I was ice skating on the lake, he ice fishing. After a long discussion about local politics, development, the Holland club (don't you dare try to do anything but passive recreation there, Yorktown!) , he said "they [Yorktown government officials] treat us like second-class citizens." I've only lived here a few years, but I have to agree with the spirit of his sentiment. 3) A commenter on another subject on the Patch pointed out that Mohegan Lake has not really had a representative on the Town Board since 2000. It feels like most of the TB members familiarity barely extends beyond Route 6 which is probably the most blighted of the entire area; an area that is predominantly residential. 1) I want to bring a voice to the board for residents of Mohegan Lake and Shrub Oak. 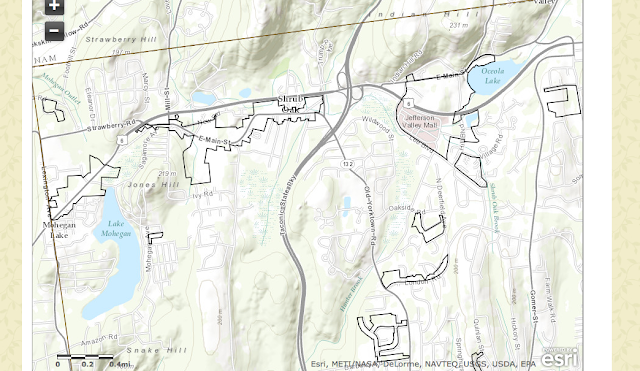 This area is more dense population-wise because the area is zoned much smaller than Yorktown Heights, yet 100% of the Town Board lives on the "south side." I think that needs to change and we can do it. 2) I have an architecture degree from the Cooper Union and have worked for the last 12 years in New York City as a building code and zoning consultant. This period was the biggest overhaul of their system bringing about more accountability, transparency while streamlining the approval and building process. This experience uniquely qualifies me as a person who can take the initiative to revamp Yorktown's antiquated and outmoded building department. Originally being from Colorado, with it's strong libertarian bent, I'm choosing to run independent. I don't want the baggage that comes with the entrenched Democratic and Republican parties. Are you ready for the First Annual Mohegan Lake Ice Fishing Derby and Skating Extravaganza that begins tomorrow? Here's some video from Thursday evening. There is some interesting ice on the lake; my sphincter tightens as I go over the starfish-octopus-blood vessel shaped black ice. The previous ice never melted and the old fishing wholes opened up in that warm spell, creating those interesting shapes. I reached my hand in an ice fisherman's hole (created late this afternoon) and it's 6+ inches in the middle of the lake. The edges are thinner; the SOLE beach is just frozen so stay away. Hope to see you out there tomorrow. I'm aiming to do a lap around the entire lake tomorrow morning with my cousin. Under the bridge? Maybe. Below is a message from MLID. 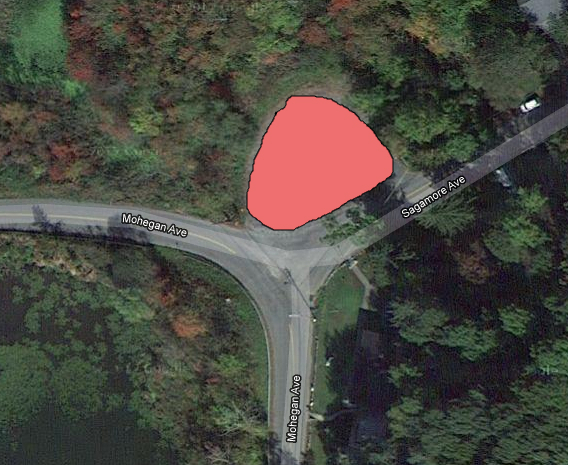 There will be a meeting of the Mohegan Lake Improvement District on Thursday January 31st. Details to follow in a few days. Hope you can join as we deal with the many things to be accomplished to improve Mohegan Lake water quality. Meetings are held at the Mohgan Colony Association's awesome facilities. Check out their Awesome Martha Guinsberg[sp?] Pavilion, below. The meetings are held across the street from here, indoors--in a heated space. Brrrr...Stay warm. It begs a summer movie festival, right? Anyone have a projector and some audio equipment to lend us? Keep thinking chilly thoughts. 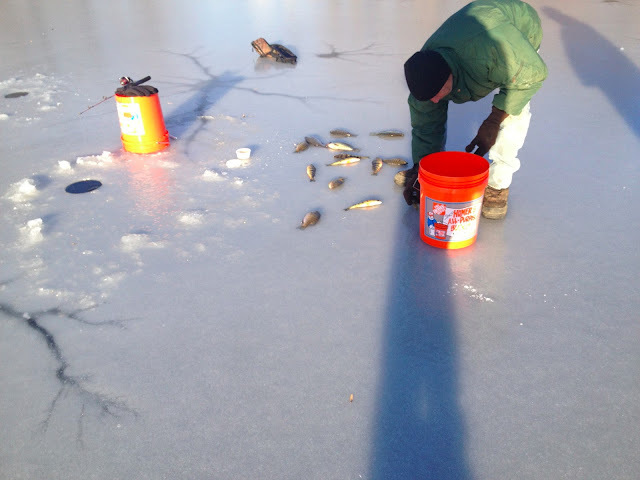 The 1st annual Mohegan Lake Ice Fishing Derby and Magical Skating Party will begin on 1/26/2013. It will continue as long as the weather cooperates. The high of 31 we see today will be the highest temp through next weekend with a low of 6 on Wednesday night. In researching lake ice, I came across this great blog from a fellow from upstate [?]. I highly recommend you take a peek; if nothing else, at least check out the ice safety sections. 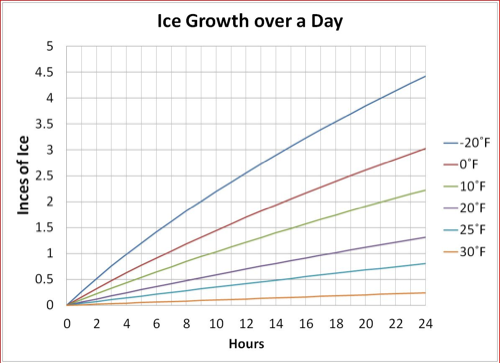 This is a link to the ice growth section where I found the chart. Many factors weigh into ice formation, such as lake flow, vegetation, the topography of the lake bed, etc...but this is a good rule of thumb for average temps. 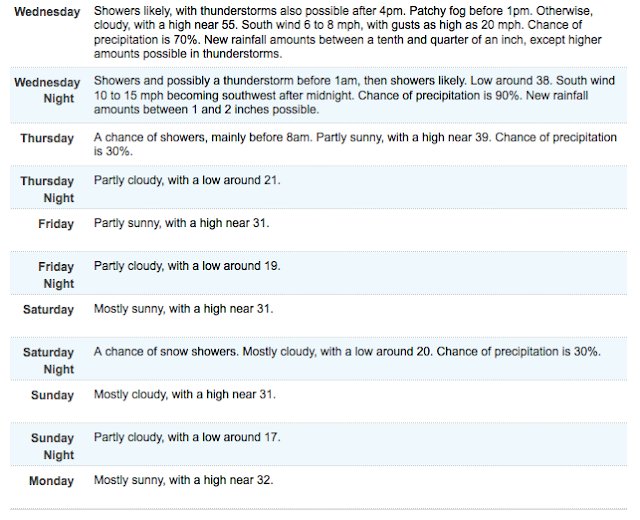 This puts us at least 5 or 6 inches of new ice (plus the existing) next Saturday. In the meantime brush up on your ice safety; if you need supplies like an ice auger to drill a hole to ice fish, shop local at the Mohegan Sportsman. Bear Mountain will sharpen you skates for five bucks (great deal and they do a great job); a good edge is essential for a fun time on skates. I leave you with this amazing video (also found on the Lake Ice blog) from Sweden. It's on a lake 1.5 times as big as Lake Champlain and has underwater waves that creates this powerful display of ice sheets being crushed together like tectonic plates? I really don't know what's going on, but check it out. I'm closely monitoring the weather and the National Weather Service is telling me that we'll max out at 30 degrees Fahrenheit beginning Sunday night (1/20/13) through Friday. If that holds, I'm going to make a bold prediction that we're skating on Saturday morning through the weekend. Ice fishing? You know it. Considering that this is probably the last hurrah before another early spring and a prolonged algae bloom, I say we celebrate with an ice fishing derby and ice skating festival. 1st annual. If you don't show up, I'm taking home all of the prizes. All lake activities will be conducted "at your own risk," as it may be a little dangerous. It's also advisable that you have lake rights so you're not trespassing. There are ceratinly precautions you can take, like wearing a life vest under your coat, the buddy system, ice claws, etc... to ensure you're safe. 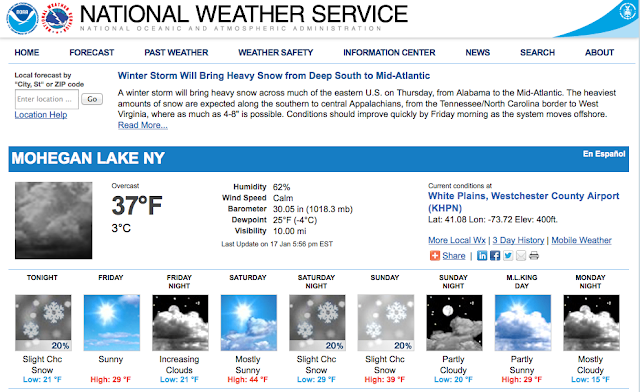 NYSDEC recommends 2 inches (seems thin, right?) of solid clean ice for people. 3 inches for people single file. 7.5 inches for small cars, etc..
Anyhoo, stay tuned. We may get another winter miracle that provides us with a 105 acre ice skating/fishing ground next weekend. The Daily Yorktown is reporting that one of the two brothers at Napoli pizza was arrested for selling cigarettes to a minor. I've seen them selling loosies before. This is a shame. For what it's worth, I still think they make the best pie in the area at a very reasonable price. Plus they are pretty funny guys. They should just get out of the cigarette business altogether. In related news, I quit smoking over 3 years ago using Chantix. Wow. It sure is special when the lake freezes and--even if for just a few brief days--we have a very different and intimate experience of Mohegan Lake; from ice fishing to skating, it's a beautiful asset for the whole lake community. Alone with his thoughts, and some frozen fishes. In the distance, the Holland Sporting Club property. Can't get enough of the frozen lake. Skating, for me, is very therapeutic and serene. That is all for today. Again, this is not an endorsement of the lake's safety. Attempt fun activities on the frozen lake at your own peril. Starting 'em early in their PJs, to boot. I had tried to upload this earlier, but I did it all wrong. This post is not an endorsement as to the safety of skating on Mohegan Lake; but for the record, I think it's safe through tomorrow. That said, you may die or be seriously injured if you attempt to emulate what you see in the video below. It sure is fun though. Huzzah! Fish (and skate) On. I got a good 30 minutes of skating in this morn. Ice is perfect. A bit thin(3"), but perfect. Just a reminder: you take your own life into your hands when you step out there so know what you're doing and, it's a private lake--trespassing is bad. It's surely been cold enough to make some nice clean ice. 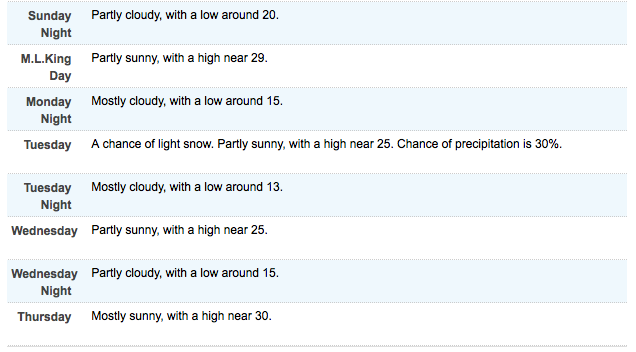 We just broached 32 degrees today (about 35) for the first time in over a week, I believe. Last week, the Mohegan Highlands Property Owners Association (MHPOA) made a last minute effort to retrieve our floating dock. We were too late and are now left to ponder how badly the ice will chew it up this winter. The ice had just decended past the dock overnight. We did note the new dock that seems to be dating ours. If you're missing your dock, let us know, it's frozen next to our and we'll return it this spring. Oh by the way, are you missing a boat? Just to the right of the Tulip Tree, and just below that first branch--above the two wires--you can see a couple wild and crazy guys ice fishing on Thursday. A bit premature? Possibly. I'm going to take some ice cores tomorrow and report back. Will probably break out my skates to do it. In summary, don't go out on the ice unless you, a) have a legal right to be there--it is a private lake after all and, b) are prepared to die; it's a dangerous thing walking on ice. 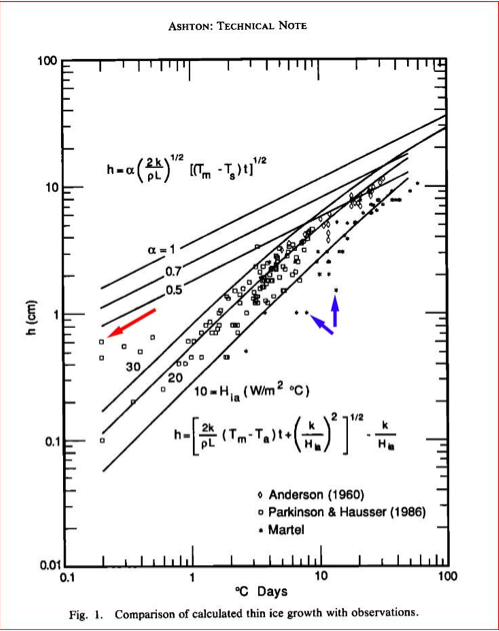 It's not just the thickness of ice, but how it formed and many weather factors--not just temperature, plus the thermodynamics of the lake, vegetation, lake flow, blah, blah, blah. Read up on New York State DEC guidelines on ice fishing safety here. Let's pray for more, consistently frozen temps and we should have an awesome winter! Which brings me to my main point: snow removal is your friend. It's a friend of business because if walking to your establishment is an option, that's a good thing. As a consumer, I sure like that option too. Especially if parking is tight (route 6, I'm looking at you) and you can walk to a couple nearby businesses without moving your car. Yorktown wisely, it would seem, put a local law on the books at the end of 2011. You can read the whole thing here on the Yorktown website. You can also see a map of the snow removal districts. A couple small, out of the way ones that appear in areas you wouldn't suspect, like camp Nabby. There is a sidewalk under there. I promise. Apparently these are some of the snow removal districts. Pffffft. Doesn't mean anything if you don't enforce the law. In a Snow Removal District within twelve 12 hours after a precipitation event has concluded, the owner and or occupant of premises abutting or bordering on paved sidewalks along a town street shall remove all snow and ice from such sidewalks or in the cases where the snow and ice on the sidewalks cannot be removed without injury to the sidewalks shall thoroughly cover the sidewalk with sand salt or other suitable material so as to make the sidewalk safe for public use. 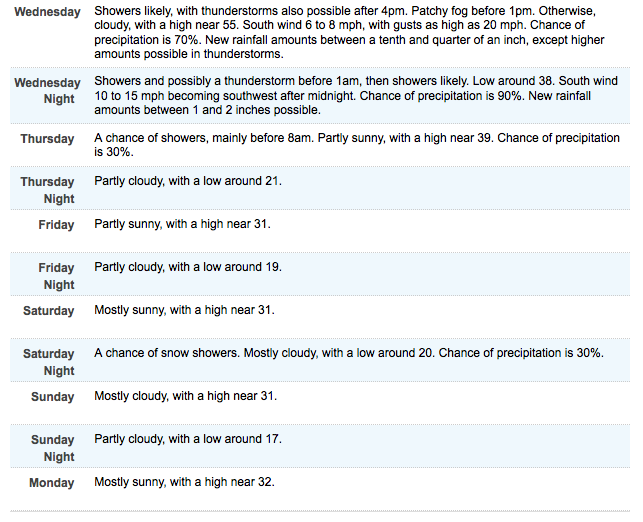 "Precipitation event." Good stuff. But seriously, the Yorktown lawmakers had their hearts in the right place when they passed this legislation. I just wish they would take the next step and enforce it. Sometimes I feel like there's literally no enforcement around these parts. Kneeling bus won't help you here. To be clear, Yorktown put the onus of compliance on the property owner. In most cases, the business occupying the commercial space is simply renting from a landlord and is not responsible--nor should they be(unless clearly spelled out in the lease)--for the snow removal. We are left with a hot mess that is--ironically--cold and icy and incredibly hard to get rid of after--say--a 12 hour period. There is no foreseeable let up in the freezing temps. You might think that I'm just a whiner, but I'm reminded of my mother who was taken too soon by cancer; she spent the last yeqr or so in a wheelchair. ADA accessibility is poor to begin with and snow and ice can make sidewalks impassable. I can't imagine my pregnant wife traversing some of these areas with our 3 maniac beautiful children. Hold on Grandma, it may be a bumpy ride to the tea house. What would I do to fix the problem, you ask? I would start by enforcing the law. Issue a violation to a property owner for non-compliance accompanied by a civil penalty. Not a bad source of revenue either. Maybe owners just consider the fines the cost of doing business. Maybe they actually shovel and salt their walks. Landlord doesn't pay the fine? That's easy, the civil penalty becomes a judgement lien and sits on the title of the property. It's not rocket science. We could even go further and hire companies to clear the sidewalks of deadbeat owners and bill them back for this service. Let's be reasonable and start small though. Baby steps. If only Yorktown had an employee(s) responsible for enforcing our laws. If only.